The French Beauty Secret is going global. Now available in pharmacies in Europe, on Amazon, on Tmall Global and in DFS. Traditionally only available at aesthetic medicine clinics, mesotherapy treatments involve micro-injecting vitamins, minerals and amino acids into the skin, to rejuvenate and enhance the complexion. Laboratoires Surface-Paris revolutionised anti-aging treatments by formulating MESO-GLOW and MESO-BRIGHT. The first of its kind, these at-home mesotherapy treatments provide the skin with a concentrated dose of vitamins and hyaluronic acid, and is safely applied with a Meso-Roller which was developed for all skin types. The French, known for their "less is more" approach, are advocates of a natural-looking beauty and are addicts of mesotherapy. Adapted to the lifestyle of active women who lack the time to visit a skin clinic or beauty spa, at-home mesotherapy treatments MESO-GLOW and MESO-BRIGHT are specially formulated to elevate your skincare routine and revive your complexion. Inspired by medical mesotherapy, MESO-GLOW is a powerful 5-week at-home treatment, that reinvigorates the skin and boosts the complexion. It consists of 3 powerful actions to revive glowing skin. The Anti-Aging Action - due to the moisturizing properties of the miracle resurrection plant, Myrothamnus Flabellifolius, paired with hyaluronic acid. The Antioxidant Action - reinforced by the power of Vitamin C and Copper Gluconate known for quenching free-radicals. The Anti-Pollution Action - thanks to Buckwheat extract which provides a shield against oxidative factors. 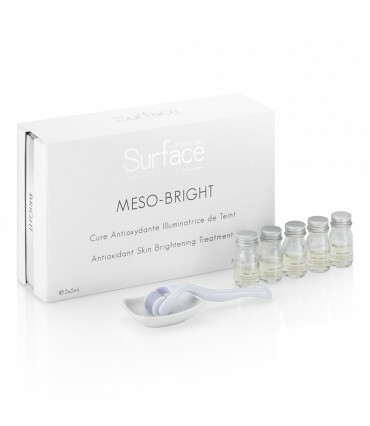 Inspired by medical mesotherapy, MESO-BRIGHT is a 5-week at-home antioxidant treatment that illuminates the complexion. It consists of 3 powerful actions to brighten the skin. The Illuminating Action - caused by Gallic Acid, reduces and prevents the appearance of hyperpigmentation spots. The Antioxidant Action - activated by Wakame, an algae harvested in Brittany, France, protects the skin free radicals and the adverse effects from aging. The Anti-Aging Action - generated by the strong moisturizing properties of Hyaluronic Acid and Vitamin B3. 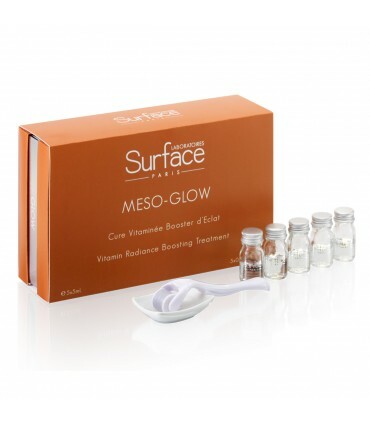 Meso-Glow is an express treatment for a glowing complexion." A vitamin C treatment for the face." "After using Meso-Glow, don't think of anything else, just go to bed. And when you wake up the next day, you take 10 years off your face." "Meso-Bright: A brightening treatment for luminous skin." An innovation in the beauty sector." "Meso-Glow: The secret of eternal youth." 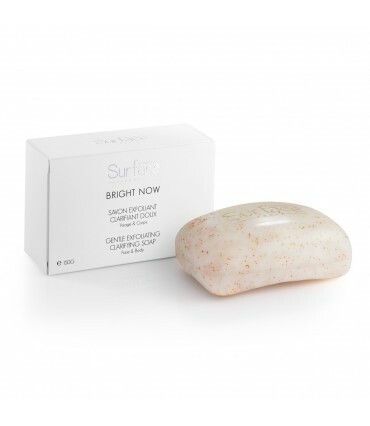 Our Bright Now and Perfect Glow ranges are powerful cosmeceutical lines both in their concentration of actives and in their profound effects on the skin. French beauty secrets, insider tips from beauty experts, beauty news, and product reviews on The Beauty Edit by Surface-Paris.